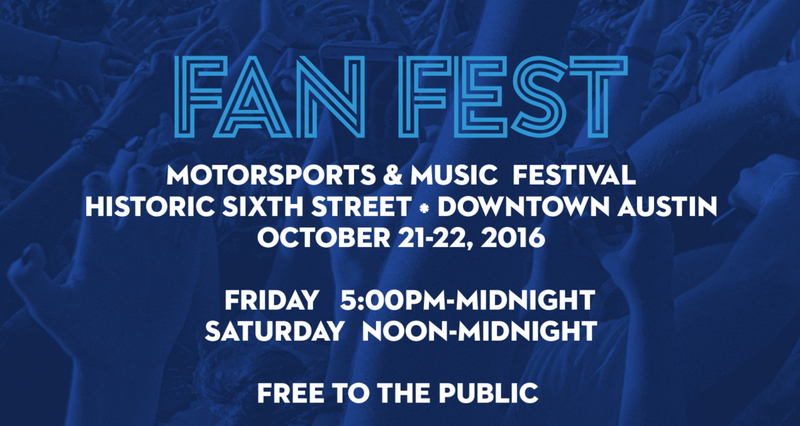 COTA announced today that Fan Fest will be taking over 6th Street in Downtown Austin on Friday, October 21st and Saturday, October 22nd. For the ultimate downtown action, Fan Fest will take over 6th Street between San Jacinto Blvd and Neches Street in the heart of downtown with experiential and exciting activities for the ultimate race fans including car displays, photos and exhibits, activations from Facebook, Bud Light, Topo Chico, Perky Jerky, Advance Auto Parts, and much more. Performances by some of the locally loved bands set to play at the track will also appear during Fan Fest from 5 p.m. to midnight on Friday, October 21st, and from noon to midnight on Saturday, October 22nd. FAN FEST is 100% free and open to the public. Tickets for the exhilarating race weekend are available for purchase at www.circuitoftheamericas.com.